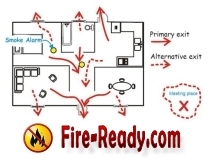 Fire-Ready.com Is Your Resource For Home Fire Safety Products, Tips and Planning. Are you currently doing all you can to prepare your home and family in the event of a house fire? Unfortunately most people are not fully equipped to deal with these all to common disasters. House fires occur at the rate of 350,000 to 400,000 a year killing 3,400 Americans and injuring an additional 18,000 more. While these numbers are staggering, the truth is that a large majority of these deaths & injuries could have been avoided with the right tools and plan. According to the National Fire Protection Association, 40 percent of all house fires are cooking related. It's all to easy to accidentally leave a burner on or run out of the house forgetting about that casserole in the oven. Besides cooking, here are 9 other common causes of house fires. As you can see, house fires happen because of daily activities or things that we all use. While most of these activities and things seem safe, it only takes one mistake or a little bit of negligence for a fire to occur. Not having the proper fire safety equipment can put you at a huge disadvantage when it comes to preventing and dealing with fires. Here is a list of four crucial fire safety products that every responsible person should have in their home. Of course, having all the proper safety products won't do you or your family any good if you don't know where they are or how to use them. This is why it's important for everyone in your household to be involved in putting together a home fire safety plan. A proper home fire safety plan should include prevention, preparation, practice & maintenance. Prevention - Having a monthly conversation and safety inspection of your home is an easy way to prevent house fires. Here are some things you and your family should pay attention to. If you use space heaters, keep them where they will not tip over easily. They should also never be within 3 feet from things that could catch fire. Always check stoves and BBQ's after you are done cooking. Don't leave your cooking unattended. If you smoke, don't leave cigarettes or ashes unattended and don't smoke in bed. Check for worn wires on your electronics, computers and lamps. Be aware of were you place your clothes, towels, blankets and other items. Never put them next to heaters or stove burners. If you have a wood stove or fireplace, have the chimney cleaned and inspected on a yearly basis. Preparation - Preparing for an emergency should be the next step in your home fire safety plan. Make sure you've acquire all the necessary fire safety products including smoke alarms, fire extinguishers, fire escape ladders and fireproof safes. 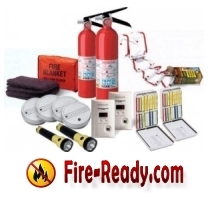 After you obtain your fire safety products, you then need to place them throughout your home accordingly. Here is where your safety products should be placed. Smoke Alarms - Besides having a smoke alarm on each level of your house you should also have one outside the sleeping areas which is usually a hallway around the bedrooms. Fire Extinguishers - Every home needs at least one fire extinguisher but really should have at least two or three. Since a large majority of fires occur in the kitchen or close to it, you should have one in there. If your home has multiple stories than you should also have one on each floor. Fire Escape Ladders - You should have one fire ladder placed in each bedroom on the second and third levels of your home. Fireproof safe - Although placement of your fireproof safe isn't a big deal, its important that you get all your important things in the safe. These items include insurance policies, birth certificates, passports, digital copies of family photos, safe deposit box keys, contracts, social security cards, wills, spare keys to vehicles, vehicle titles, investment papers, cash, jewelry, coins, etc. After placing your safety products, you should then sit down with your family and draw up a map or fire escape plan that outlines where everything is located as well as possible exits from each room. You should also set up a meeting place outside of your home where everyone will meet incase of an emergency. Practice - The next piece of your home fire safety plan is to practice on a regular basis. Besides running family fire escape drills, each capable member of your family should also have practice using fire extinguishers and fire escape ladders. Maintenance - The final step in your home fire safety plan is to keep your fire safety equipment well maintained. Maintenance should include keeping tabs on fire extinguisher expiration dates, testing and changing smoke alarm batteries, plus conducting inspections on your fire escape ladders. Is Your Home & Family Prepared? Chances are that you don't currently have all of your home fire safety products or planning done. With so many brands and models of to choose from though, finding the best fire safety products for your home can be a confusing task. Don't worry because we've got you covered! By using the information guides below you can have your entire house fire ready within the next 48 to 72 hours.